Nassau County, NY - May 4, 2015 - Flags at County Government Buildings Ordered to Half-Staff. “Nassau County mourns the loss of NYPD Police Officer Brian Moore, a North Massapequa-resident, who was assassinated in cold blood. This tragedy further highlights the dangerous job of serving the public as a police officer. Officer Moore’s bravery and devotion to protecting our region and way of life put him directly in the line of fire. The laws of New York State must change if we are to keep our residents and police officers, like Brian Moore, safe. I again urge State officials to immediately end parole for violent offenders who violate their parole, call upon the State Parole Board to enforce the longest maximum sentence under the law for violent offenders after the first conviction, and reinstate the death sentence for those that kill police officers. No words can comfort the Moore family during this time; however, I want them to know how grateful Nassau County is for Officer Moore’s bravery in serving as a police officer. My wife Linda and I extend our thoughts and prayers to the Moore family, Brian’s loved ones and all those who serve in uniform. May God watch over the family of Police Officer Moore as well as all those who keep our cities, communities and nation safe." 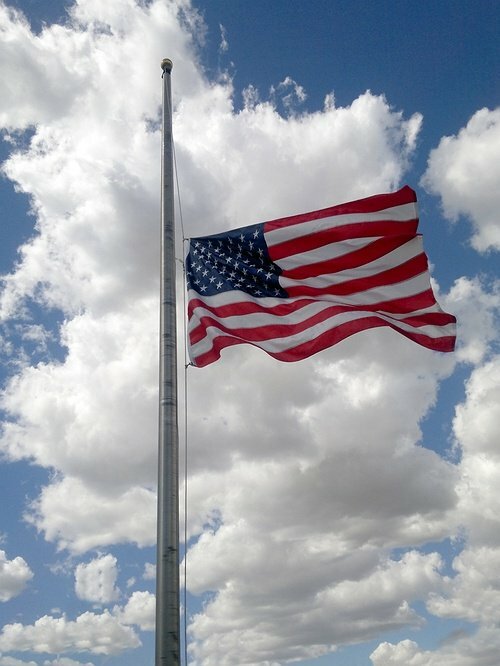 Flags on County government buildings are to be flown at half-staff effective May 4, 2015 through June 2, 2015 in honor of NYPD Officer Brian Moore and in honor of his service to the people of New York City. Photo by Edgar Olivera, via Free Images. Subject: LongIsland.com - Your Name sent you Article details of "Nassau County Mourns The Loss Of NYPD Police Officer Brian Moore"